If you are dreaming of going to eat Chinese, why not try and make it? This Yummy ribs go great with any of the classics, like fried rice (Arroz Chaufa), Lo-Mein or Sticky Rice. I might not be Chinese, but in Peru eating Chinese Food is part of the Food Culture of our Country. I have try many ways to accomplish this dish, so far this is the closest i can offer you. I will update as I keep trying, thou I think like this works great!!! If someone out there makes it and find that adding something else makes it better, please comment, I will try your changes, I am always happy to try new things. 1/4 Cup plum sauce, if is not sweet add a bit. 2 lb pork spare ribs, or baby back ribs, lightly salted and sprinkle five spiced mix on it, liberally, but without overwhelming it. 1. Mix all the first ingredients and boil for 1 minute, cool slightly. 2. With the sauce you just made, marinate your meat for 1 hour at room temperature or 3 inside fridge. 3. 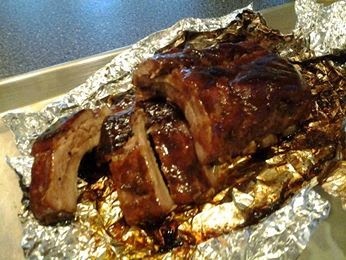 Wrap the meat in foil, but first oil the bottom of the foil, fold tightly. 4. Oven at 400 F. for 15" to 20", then lower and cook closed until meat is tender, internal temperature of 190*F, open and baste with sauce and cook for a few more minutes with the foil open. 5. With the rest of the sauce you did not use, boil again and thick sauce slightly, with the cornstarch mixture.